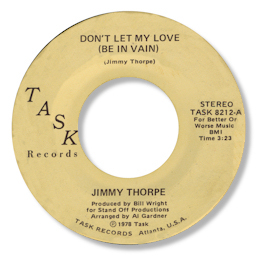 The mysterious Jimmy Thorpe recorded three 45s that I’m aware of – all of them in different locations and all them in demand for one reason or another. His Choice Cut single was recorded in Charlotte, NC and co-produced by Ron Henderson of the Choice Of Colors group. 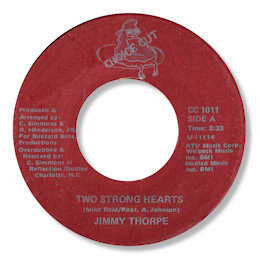 “Two Strong Hearts” is a pounding uptempo number that the modern soul crowd seem to like. 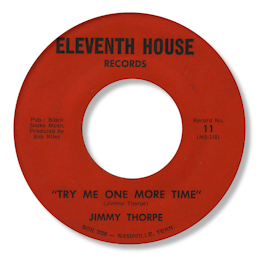 Thorpe’s Eleventh House was produced in Nashville by Bob Riley, and while “Free Me Love” has had some northern soul action, I much prefer his own Try Me One More Time which is a pleasant country soul ballad. But it is his final 45 for Atlanta, GA based Task that I want to major on here. “I Wanna Go Back Home” is a funky little guitar/organ number, but the flip is something really special. Don’t Let My Love (Be In Vain) is a fantastic deep soul item, held together by pumping piano, tasteful guitar fills, and a big horn section, on top of which Thorpe slips and slides around the melody, delaying his phrases really well, and the way he pulls the words around is straight from the Otis Redding school of singing. You have to look twice at the label to believe this was cut in 1978 – it sounds about a decade earlier than that – a real throwback sound. The superb production was by the excellent Bill Wright.